TORONTO – Fiercely driven and radically experimental, Joseph Mallord William Turner (1775 – 1851) was a giant in the history of British art. Praised by critics across the U.K. as “an exciting, entrancing show” (The Guardian) and “sensational” (London Evening Standard), the acclaimed exhibition J.M.W. Turner: Painting Set Free opens in Toronto at the Art Gallery of Ontario (AGO) on Oct. 31, 2016. Featuring more than 50 paintings and watercolours on loan from Tate Britain, the exhibition focuses on the artist’s later works, famous for their rich colour, textures and arresting use of light. Timed-entry tickets for J.M.W. Turner: Painting Set Free at the AGO go on sale Oct. 16, 2015. The exhibition is celebrated by the launch of the AGO’s permanent new hours of operation, featuring extended Friday nights with special Turner-themed programming throughout November. Tickets for J.M.W. Turner: Painting Set Free can be purchased online at www.TurnerAGO.com, in person and over the phone and are $16.50 for youth ages 17 and under, $21.50 for seniors and $25 for adults. AGO members will be offered free admission to the exhibition and exclusive previews in the days leading up to the public opening. AGO membership information can be found at http://www.ago.net/general-membership. Coordinated by Lloyd DeWitt, AGO Curator of European Art, J.M.W. Turner: Painting Set Free shows how Turner’s final years were a time of exceptional vigour, as he continued pushing the boundaries of his artistic practice while travelling across Europe to capture increasingly dramatic landscapes on canvas. Challenging the myths, assumptions and interpretations that have grown around Turner’s later works, the exhibition is organized thematically and takes a focused look at his travels, his fascination with classical history, religion and mythology, his love of the sea, and his preoccupation with atmosphere and light. This fall, the AGO celebrates the exhibition with an exciting series of themed events, talks, menus and screenings. Making its debut on Nov. 6, 2016 and continuing weekly thereafter, AGO Friday Nights launches with an exciting series of Turner-themed programming throughout the month of November. Featuring drop-in art making, talks, tours, a wine bar and a delicious tapas menu, AGO Friday nights are included with general admission, and free to AGO Members. In partnership with Tapestry Opera, Canada’s largest and most influential contemporary opera company, the AGO presents Music Set Free, a series of live performances inspired by Turner, each Friday in November from 7:30 p.m. to 8:30 p.m. Curated by Michael Hidetoshi Mori, Artistic Director of Tapestry Opera, and featuring a range of composers from Beethoven to Britten, these concerts will capture a selection of music from Turner’s time, pieces inspired by his influences, subjects and artistic practice, and will include a special world premiere of an original work commissioned in response to the exhibition. The larger-than-life artist makes the leap from the canvas to the big screen in a special AGO screening of Mike Leigh’s biopic, Mr. Turner. Visitors can experience Timothy Spall’s Cannes-winning performance on Oct. 30, Nov. 4, Nov 27 with a special introduction by Lloyd DeWitt, AGO Curator of European Art and Dec. 12 at the AGO’s Jackman Hall Theatre. Tickets are on sale now at www.ago.net. Family Sundays return this fall on Nov. 1, 2015 with a Turner-sized celebration for kids of all ages. Featuring Turner-themed art-making, hands-on activities and family-oriented tours, Family Sundays are included with regular admission and run from 1 p.m. to 4 p.m. in the Weston Family Learning Centre. For more details, visit www.ago.net/family-sunday-programming. Families can also stop by the Margaret & Jim Fleck Gallery to relax and engage with art-making, books and ideas in the Family Creativity Lounge. The AGO’s Weston Family Learning Centre provides families a dedicated area for art instruction and creative play. The Dr. Mariano Elia Hands-On Centre is open to the AGO’s youngest visitors from 10 a.m. to 2 p.m., Tuesday through Friday, and 10 a.m. to 4 p.m. on Saturday and Sunday. The Gallery welcomes Sam Smiles, professor of Art History and Visual Culture and co-curator of the Tate Britain exhibition Late Turner, for a lecture on Nov. 13, 2015. Reviewing Turner’s last works, Smiles proposes that if we are to do justice to Turner’s achievement, his final paintings are best understood within the broader framework of nineteenth-century art. Tickets for this talk are on sale now at ago.net/curators-talk-sam-smiles. Beginning Oct. 29, 2015, FRANK restaurant at the AGO celebrates the flavours of Britain with a series of vibrant prix-fixe menus. Featuring reimagined classics of English dining, like seared scallops and mushy peas, duck cassoulet and Eton mess, these three-course prix-fixe lunch and dinner menus are available for $35. A prix-fixe dinner and exhibition package will also be available for $65. For reservations, please call 416-979-6688.
shopAGO welcomes Turner with an artful selection of British-inspired gifts, stationary, home décor and prints. A 224-page colour catalogue entitled J.M.W. Turner: Painting Set Free and featuring 130 colour plates accompanies the exhibition. Published by the Art Gallery of Ontario, this monograph features essays by all three original co-curators, and will be available for purchase in shopAGO and online for $55. For more information about special programming offered in conjunction with the exhibition, visit www.ago.net. J.M.W. 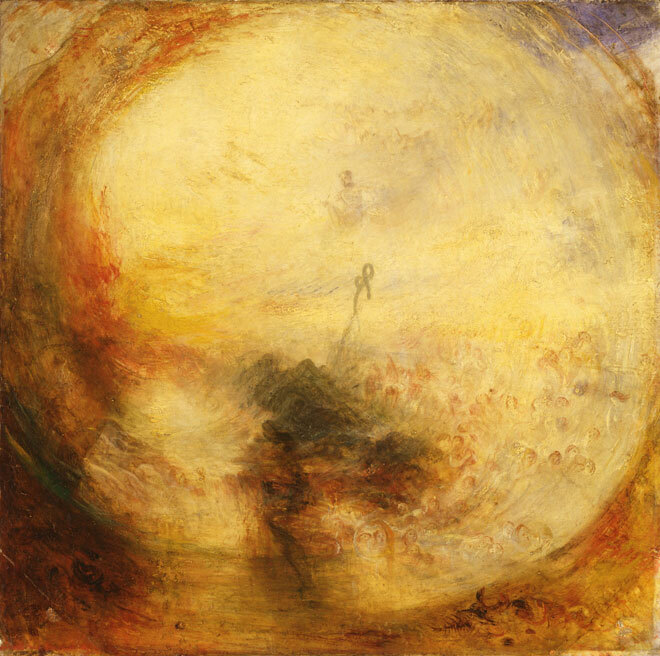 Turner: Painting Set Free is organised by Tate Britain in association with the Art Gallery of Ontario, the Fine Arts Museums of San Francisco and the J. Paul Getty Museum. With a collection of more than 90,000 works of art, the Art Gallery of Ontario is among the most distinguished art museums in North America. From the vast body of Group of Seven and signature Canadian works to the African art gallery, from the cutting-edge contemporary art to Peter Paul Rubens’ masterpiece The Massacre of The Innocents, the AGO offers an incredible art experience with each visit. In 2002, Ken Thomson’s generous gift of 2,000 remarkable works of Canadian and European art inspired Transformation AGO, an innovative architectural expansion by world-renowned architect Frank Gehry that in 2008 resulted in one of the most critically acclaimed architectural achievements in North America. Highlights include Galleria Italia, a gleaming showcase of wood and glass running the length of an entire city block, and the often-photographed spiral staircase, beckoning visitors to explore. The AGO has an active membership program offering great value, and the AGO’s Weston Family Learning Centre offers engaging art and creative programs for children, families, youth and adults. Visit ago.net to learn more.